The Tale is adapted from Petrarch’s Latin translation of Boccaccio’s Decameron. The Tale follows Petrarch’s version closely, but the main issue stems from the disconnect between how it was originally written and what the Clerk does with it at the end. Is it meant as a didactic piece to inform wives of how they should behave? Does it reach even further to instruct all men how to behave towards God? Is it a cautionary tale against being too dutiful of a wife? As we looked at when reading the General Prologue, a large part of the Canterbury Tales is concerned with depicting what happens when an idealized situation becomes reality. In a patriarchal society an obedient wife is thought to be a treasure, and there is no wife more obedient than Griselde. She is not simply obedient, but her unrealistic exaggeration of subservience escalates to the point of madness, not for her, but for the reader. In Part I we have the set up for the story in which Walter is first introduced. Interestingly, the portrait of him given is not one of a tyrant, but rather a well-intentioned ruler who is held in high esteem by his people, and most importantly responds to their desires, and not just for show, as the people come to him with their grievances. Had he been a malicious despot they would be far too afraid to do so. By the end of the first part Walter appears to be the perfect man and ruler. In fact, he is such a great ruler the people want him to have an heir for their land, which he cannot do unless he marries, and that is what they ask of him. Despite that he does not wish to marry, he concedes in order to make his people happy, offering further proof of his charity. However he shall do so in his own way, meaning he will pick his own bride as opposed to having court officials find one for him. In Part II he continues winning the audience over with his reasonable way of thinking, and when he decides to take a peasant girl as his bride, he displays unbelievable humility and magnanimity. Up until this point it seems like Prince Charming has come to rescue Cinderella; it is hard to believe that there are still three more parts to the story. Griselde is everything he could have wanted, her continence is to his liking, and the people adore her. At the end of the second part she has a child, and even though it is a girl (not the male heir everyone wanted), it shows she is not barren and thus can still produce a baby boy. As with most five part plots, it is in the third part that the problem presents itself. From the beginning lines it is made clear that Walter plans to test Griselde’s patience, goodness, and loyalty to him, “needless, God woot.” Recall in the second part as he asked her to marry him, he included that he “frely may, as [he] best thinketh, do [her] laughe or smerte.” In the middle of the joyous event those few lines are easily overlooked, and appear no more than a formality, especially considering the fairness he had until that point exemplified. We spend two sections of this story really liking Walter, and loving Griselde. The idea that he would now test her, for apparently no other reason than his own curiosity, is completely surprising. This is also what causes numerous critics to align Walter with God(s) testing the loyalty of humans (i.e. Abraham, Job, etc), or toying with them for their own amusement (i.e. most Classical myths), which is in line with what Petrarch also took away from Boccaccio’s version. Yet, consider who is telling the story. The Clerk is a scholar, and while this story may have had a different significance in the original format, or through other translations, here it is used to exemplify what happens when knowledge is pursued aimlessly. In the General Prologue when we looked at the various character descriptions the Clerk was next to the Man of Law to contrast using scholarly knowledge in a meaningful way, as in a professional pursuit, and listlessly studying without ever using your knowledge – essentially hoarding it for one’s self, and wasting it away. If we bring that meaning here, Walter is a manifestation of a clerk, or more specifically, a scientist who is running an experiment on Griselde just to see what happens, without the possibility of his findings serving for the betterment of humanity in any way. He has a hypothesis in mind, which he iterated in the beginning as he told the townspeople he does not plan on taking a wife as he does not feel there are any women suitable to his needs. We later find his needs encompass a woman who will never, under any circumstances, deny him anything, or show anger towards him. He does not believe such a woman exists. Thus when he tests Griselde he does so in order to prove that no woman will ever hold true to this. He is not only expecting her to fail, but hopes she does so that he may be right. He does not simply pick a fight with her, or make her relinquish her favorite trinket or dress. Instead he humiliates her and takes away her newborn baby, making her believe her child will be murdered in the woods. This is a complete turn from the fair Walter we had until now encountered, providing even more drama through contrast. Yet even here he is slightly redeemed because he does not actually have the baby killed, but rather has her taken to live with relatives, softening the illusion of infanticide. It is difficult at this point to discern who is most unlikable in this scene. Walter is losing his luster rather quickly, but what about Griselde? There is no question that she loves her child, and more than likely she had absolutely no say in the matter one way or another, but to simply allow this to happen without a single plea? Not even one endearment to Walter? A submissive wife may be an ideal, but at what cost? This perceived sacrifice pacifies Walter for six years, during which Griselde gives birth to a male child, and Walter once again needs to test his hypothesis. In Part IV he again humiliates her and then takes her son away in the same fashion as her daughter. Griselde says nothing. Walter’s experiment is both failing and succeeding. It appears he has successfully found a wife that will not change towards him no matter what he inflicts upon her, and will not question his will. However, his original hypothesis was that no such woman exists, thus to test it further, he ups the ante. By this point his people were outraged at his deeds; he is neither loved, nor feared, only loathed – the worst trait for a ruler to bear. Yet he perseveres in testing his wife, like a mad scientist out to prove a theory at all costs. The previous private humiliations and murder of her children were not enough, and in Part V he decides to make her humiliation public. He tells her and his people that he has procured permission from Rome to leave her and take another wife, and thus she must leave his house immediately with nothing more than what she came with, which as we remember, was nothing. She asks if, as his once wife and mother of his children, she may at least wear a shift to cover herself as she walks back to her father’s house. That is the only thing she says to him before dutifully obeying. Since the readers know Walter has not really slaughtered his children or obtained an actual document from Rome it almost seems that this is where he will stop her from leaving. In a strange twist,one would assume the readers want her away from this horribly cruel man, but since she is genuinely in love with him and inwardly tormented by the idea of no longer being with him, out of pity for her the reader cannot help but hope he puts an end to his tests and takes her back. Instead he is going to further experiment on her, in search for her breaking point. He calls for her and tells her that in order to properly receive his new young, noble wife he would like it if Griselde oversaw the preparations; after all no one knows what he likes better than her. Basically he literally threw her out into the street and is now asking her to play chambermaid to his new bride. This is unbelievably infuriating to everyone except Griselde who is able to hold steadfast to her outward display of nonchalance. After the charade continues for a bit (and he passes off his daughter as his new bride), in the denouement Walter is all of a sudden taken in by her faithful goodness and confesses everything to her, welcoming her back as his loving wife with their two children to live happily ever after. Griselde passes the test, at which point Walter realizes he has to stop his experiment because proving his hypothesis would destroy everything. He wanted to assay her until “I thy purpos knewe and al thy wille,” but unfortunately that is an endless quest since one can never fully know another. And if he continues pressuring her, should she finally break, what would he do? At this point he still holds the upper hand, able to correct everything by simply divulging the truth because in the world of fiction that is enough for forgiveness and a happy ending. However, if Griselde should push back and finally fail one of her many trials, he would be unable to renege and everything would basically blow up in his face. As the narrator of the story states, he needlessly tested her over the years, solely for his own curiosity, and knowledge without purpose benefits no one. Arguably his first test to her (albeit still unjustly cruel) should have satisfied him – she passed, and his hypothesis was wrong. Anything after that was absolutely aimless, and counterproductive. The Envoy serves to solidify this idea in the beginning lines, but then moves into a diatribe much like the Wife of Bath’s instructing women to never be subservient to their husbands. Certainly after reading about Griselde for several sections the Envoy is practically refreshing, yet Griselde was an extreme, and here is the opposite extreme, evincing that neither are appropriate or favorable. Also, to note, it has been disputed whether the Envoy belongs to Chaucer the author, Chaucer the pilgrim, or the Clerk. I myself believe it belongs to Chaucer the pilgrim, with a heavier than usual hand from Chaucer the author. I hear very little from the Clerk in there. 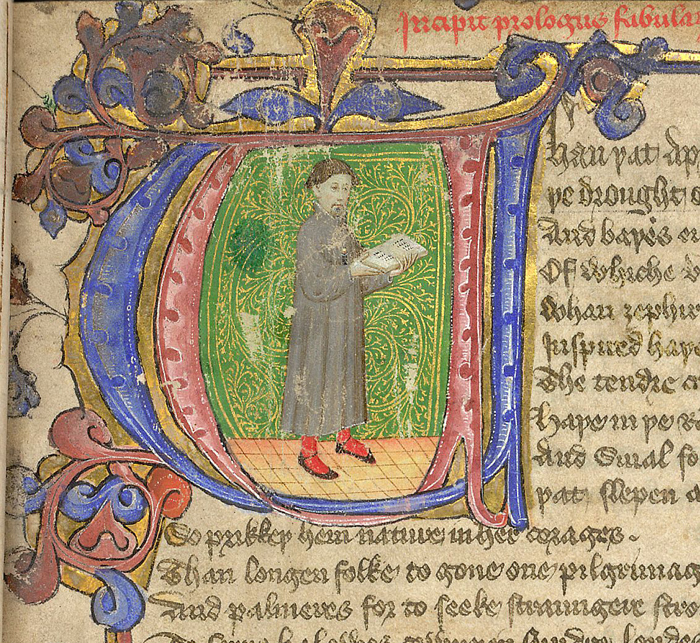 The dispute mainly comes from the last paragraph in the Envoy where it is clearly Chaucer the pilgrim taking over from the Clerk. However, this stanza does not appear in all manuscripts, and seems to have been deleted from others, implying Chaucer changed his mind. I am not going to go into detail because it really doesn’t serve a purpose for this lecture, but manuscript studies on tale orderings help to sway this debate. To condense 70+ years of academic research into a few sentences, if you are using only the Ellesmere manuscript then that stanza is not there, and the Envoy more than likely belongs to Chaucer the author. Otherwise, there are numerous other combinations and reasons to take into account. Nevertheless, regardless of codicological studies, the Clerk’s Tale serves as another example of the ways in which various aspects of the Canterbury Tales undermine the portrayal of an ideal (and often extremely exaggerated) situation.